Looking to give some of your kids’ favorites a green makeover? Check out some of my suggested swaps below! . How many parties, play-dates and dinners have we all seen these come out of the freezer? I was committed to giving you something that's equally as kid-adored, "grab and go" at the supermarket, but something that's more eco-friendly and nutrient rich you can feel good about. I love Applegate All-Natural Turkey Hot Dogs (which also have acceptable amounts of sodium, something else nuggets can be super high in). Soy turkey or chicken dogs, like those from Yves, are another great option you can feel fantastic about. Wanna go a deeper shade of green? Check the label of the soy pups carefully; if you can find a Soy pup that's made with Non GMO soy grown in the USA, go vegan and be even more lean and green. While the growing number of organic, single serve bags of crackers are certainly better than conventional, they're still highly, highly packaged foods that should only be a small part of your child's diet. A much greener, antioxidant packed choice that's just a fun and kid friendly? Popcorn you make at home! Research has found popcorn packs 5x the antioxidants of processed snack foods. If you don't have an air popper, simply put some kernels in a large saucepan, with a drizzle of heart healthy canola oil. Put a lid on and leave just a small crack on 1 side, turn heat medium high and pop away- you'll know it's ready when the interval of popping slows down considerably. Grate some parmesan cheese on top, and kids adore it. Portion out into your reusable bags or containers to send your kids packing with this greener snack idea. Check out www.3greenmoms.com for great reusable snack bags. Another saving? You'll save big bucks, as single serving snack foods can cost $4-$6 per box. My kids are 4 and 5, and I am shocked at how much kids their age are bombarded with sweet drinks; flavored waters, juices, punches, any mom can rattle off a litany of liquids their kids come into contact with during an average week. While up to 4 oz. of 100% organic apple juice, grape juice or other juice in small portions in healthy weight children is okay, loads of juice provides excess calories which has been cited as a contributing factor to childhood obesity. Another reason I like switching to water is because it helps prevent them from only wanting to drink sweetened beverages (see what's happening here with the debate about flavored milks in schools). Give kids bubble and fun while not over-sweetening their palate. 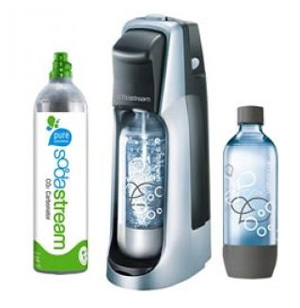 Check out my previous post on the green benefits of using Soda Stream in your home here. Of course 100% organic whole fruit leathers are a big step up from the cheaper ones loaded with added colors, sugars, and a smidgen of actual fruit. But leathers are still a highly processed, highly packaged snack (which detracts from green-ness), and all fruit leathers have a higher concentration of sugars since you remove all the water. Why not pack portable, seasonal superfruit instead? I recently did a segment on the Dr. OZ show about the anti-aging power of fruits and veggies, and included blood oranges on my list, but they’re a wonderful swap for kids too. Blood oranges have more vitamin C than any other citrus (1 medium orange packs 130% of the Daily Value of Vitamin C), and are the only citrus loaded with one of mother nature's most powerful antioxidants: Anythocyanin. That gorgeous crimson color and succulent sweet taste will have them asking for seconds. This is a seasonal superstar right now, and will hold up well for hours in lunch boxes, snack sacks, or even in a bag in the car (if you're like my kids) in between activities! I'm all for adding some dressing or dip sauce to encourage kids to eat more veggies - works like a charm - but if you're looking for a fresh twist (which many moms seem to ask me about), something that's a bit more nutrient packed and easier on the planet, you have to try this amazing dip blogged about recently by the "Meal Makeover Moms" , two amazing RDs (and friends of mine), Liz Weiss and Janice Bissex. 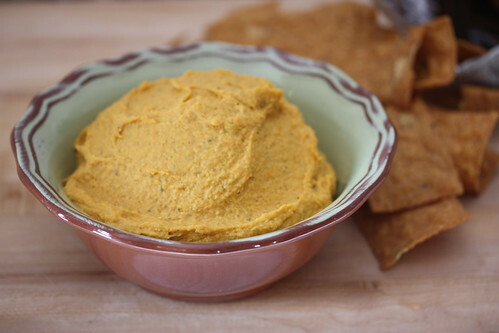 Bursting with exotic flavor (thanks to garam marsala), pumpkin seeds and beta-carotene rich squash, this is a palate pleaser that's better for your kids and the planet. It's a great place for any extra butternut squash; or simply roast some in the oven alongside your next dinner, then you can whip this up in no time the next day. What staples have you swapped out for greener living? I’d love to hear about them!